The wonder, history and creativity of electricity is here for you to explore in The SSE Heritage Collection. We're a British energy company with a proud heritage. We welcome you to the first step in a new project. We're starting to share our heritage collection with the world. Our company has its roots in many small local electricity undertakings. 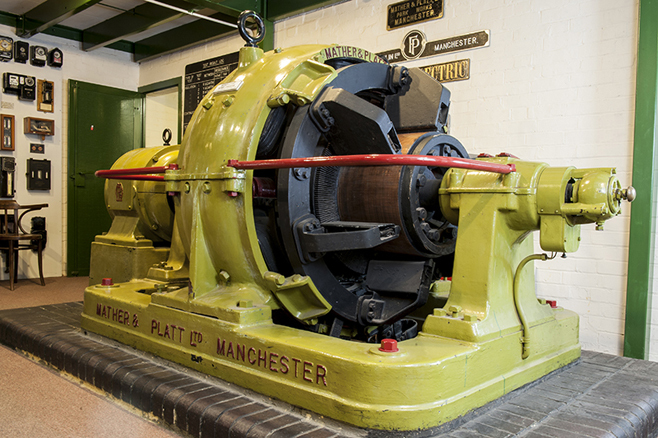 Our earliest heritage is from the 1880s, many years before the National Grid and the coming of large power stations. This was an era of few small electrical generating stations. Soon the first electric trams were moving through the streets, and electric lighting was seen, though in only a few places. Electric light was made by powerful carbon arc lamps, sizzling and flickering in the heights of railway stations and on street lamps. Some people said the electric light would never catch on in the home. Our collection of electric lamps tells another story. By the 1890s, reliable filament lamps were widely available, and electricity was a symbol of progress for the coming century. Our fascinating collection of lamps shows how they evolved to become brighter, longer-lasting, and more efficient. Yet the entire system of how to generate, distribute, record and above all safely use electricity had also to be developed. Our early switches, insulators, meters and dynamos show how it was done. The quest for a reliable electricity system to serve customers safely has been part of our story for over a hundred years. After the First World War the electrification of industry speeded up as part of the modernising and reconstruction of the British manufacturing system. By the 1920s, we were starting to join up small systems into the beginnings of a power distribution network. It would eventually link to the Grid. We have the tools and equipment that engineers of those days used to build it. We can show the sort of lights that ordinary people proudly installed in their homes. In the 1930s we delivered electricity services that touched everyone's life at home and work. Our shops and showrooms offered tempting new electrical conveniences such as vacuum cleaners, electric irons, and kettles, and we have lots of fine examples in the collection. Customers loved the convenience of electricity and how clean it was. They started to change from coal fires to electric fires, and our collection shows what people bought. In some towns, we made electricity, distributed it, and sold our customers everything they needed to use, even the lights for their Christmas Tree. We encouraged modern wiring and have many plugs and sockets. Though some people in the 30s thought that one socket in each house was quite sufficient! In these years, too, our precursor companies started the great task of building the Scottish Hydro system, which still delivers clean power today. As the Second World War drew closer, we prepared for conflict. We shut down street lights, sold tiny glimmering blackout bulbs and struggled with coal shortages. The challenge of running the distribution network in wartime was immense. Electrical loads changed rapidly. Factories built in remote areas had to be connected at unheard-of speed. Bombing damaged the network. But the Grid meant that we were able to keep the power supply going. With the coming of peace, we started a huge expansion programme. We had to keep pace with the surging demand for electricity. Our industry was nationalised. We built a distribution network in many country areas for the first time. New appliances kept the demand for power growing, as our customers bought TVs, electric fires and cookers. Our collection is richly filled with nostalgic items from those years. Industry too was hungry for power in the industrial boom. We built many new lines and substations to supply its needs. We sold storage heaters too: they were a way of balancing the electrical load at night and offering customers a cheaper way to keep warm. Power stations kept getting bigger. The last small stations closed. The 1960s and 70s saw continued growth. Our collection contains rare training material from those years, where engineers practiced how to work safely at height. We have unusual items such as a live line working suit, worn to allow engineers to work safely even on high voltage lines after much careful training. Everywhere in our collection, stories of electricity workers and electricity customers are intertwined. We are proud of our heritage and plan to do more in future to share it with everyone. Our heritage shows that our values of safety, service, efficiency and teamwork have a long pedigree. They remain central to our job today.